Renaissance Sausage makes its debutYesterday marked the return of Philadelphia's largest and most celebrated Farmers' Market. Held under the brick arch of Headhouse Square at 2nd St. between Pine and Lombard, the bustling market boasts one of the most idyllic settings in the city. There was asparagus (which went quickly), lots of rhubarb and the first strawberries of the season from a farm in New Jersey. There was also cheese, meat, dairy and lots of plants for populating spring gardens. My haul included some pea shoots (cook them like any green—they're fabulous), green garlic, some local lamb chops and strawberries (the pint is already almost gone; man, I had forgotten how good they are). I also snagged a couple arugula plants for my community garden plot (more to come on that front later today). 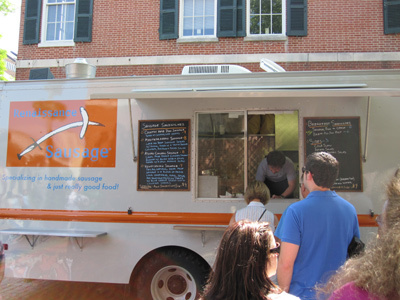 Yesterday also marked the debut of Renaissance Sausage, a brand spanking new food truck serving up local, organic meats (in tube form). I had the Mediterranean—a beef and lamb sausage topped with hummus and tzatziki and chopped veggies. It was a huge, delicious sandwhich, even if the wait was a little long—I'm sure they'll get the hang of it. Meal Ticket has the full scoop on this new venture.